It’s fascinating to see that while interest in sewing is increasing, the traditional retail outlets for patterns and fabrics are decreasing. What does this mean? Is this really a result of retailers either speaking only to shareholders (Wal-Mart), or being unable to manage their business(Hancocks)? Personally – I think the internet has a lot to do with it. Most of my favorite fabric stores are now virtual and internet based, and the best internet fabric sources work because of the expertise, trust and personality the owners communicate to their customers. And I suspect that as soon as pattern companies figure out how to deliver downloadable patterns in a way that won’t require me to tape together 48 sheets of 8.5 x 11 inch paper we might see where retail pattern trends are headed. In the end I really believe that access to fabric and patterns is not going away – we’re just in the midst of a sewing revolution right now, and the future state is still out there. I think this is an exciting time to be sewing! It’s been crazy, but I did mange to finish this gown. This is a gift to Diva Mary Beth, who as many of you are aware, has been receiving radiation and chemotherapy treatment. The goal of this project was make her something simple and fresh. This pattern is a lovely Burda WOF style from 1993, and I saved that issue because this is so simple and womanly. I think you could adapt Simplicity 4180 for a very similar look. This project turned out pretty well, and it was not as hard as you might think because I used machine embroidery stabilizer (Pellon Sol-U-Web) in the application of the lace. There are generally two types of water soluble stabilizer for fine fabrics: clear rolls or sheets that look like plastic wrap, and then types such as Sol-U-Web, which is a mesh. I prefer the mesh type because it doesn’t dry out. This is very simple style , just five pattern pieces, and it relies on one layer technique with no facings or interfacings of any kind. The lace application may look really difficult, but you take your time and use the right materials you can do something just like this. The lace itself was a rayon Chantilly galloon about 18 inches wide, and it was trimmed around the flower motifs to create an interesting transition to the beige silk charmeuse. 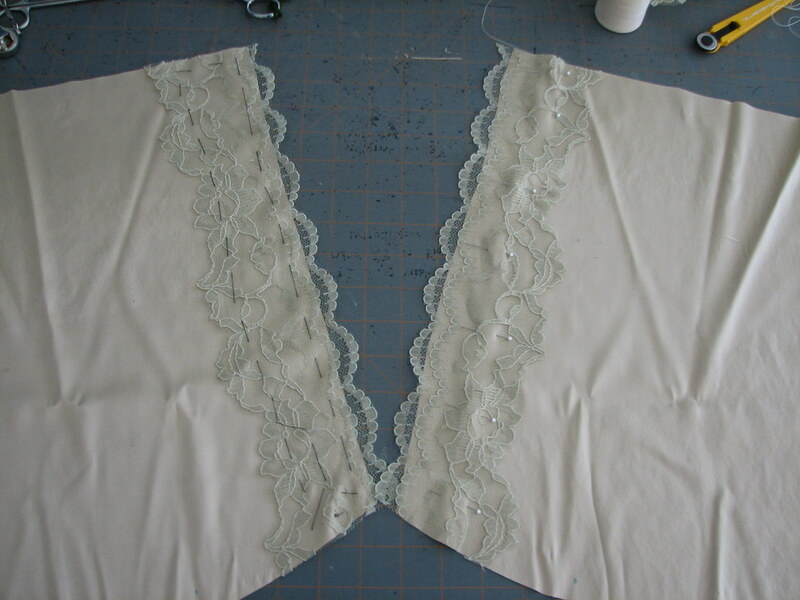 The seam allowance for the bodice pattern piece were removed at center front, and the point of the scallops were placed along that line – the scallops form the new finished edge of the center front. The lace is pinned and then hand basted to the bodice pieces. Also, notice the small portion of the scallop on the inside of the shoulder seam – this represents the seam allowance. The lace was placed this way because I wanted a perfect scallop to frame Mary Beth’s neck at the shoulder. The piece on the right has been pre-pinned, the one on the left has been basted and the pins removed. Now it was ready to stitch from the right side, using a small 2 x 1.5mm zigzag along the cut edge of the lace. Then the stabilizer was carefully pulled away and the fashion fabric is trimmed away from the back. Any remaining stabilizer is soaked off in warm water, the piece rolled in a towel, and then left to air dry. Then the rest of the nightgown goes together. After the gown was complete it’s washed again (in a mesh bag) to remove all traces of the stabilizer. The sleeve and hem edges were finished with a shell stitch. Stray threads will turn up with this type of one layer sewing, and those can be trimmed after the second washing. So – even if you have no interest in machine embroidery, water soluble stabilizers are still a really useful sewing tool. I also like using them to make buttonholes . The button hole is marked with a sewing marker right onto a strip of stabilizer, which is placed on the right side of the fabric. Then it just washes away! Some of you will remember that I made a skirt with inset godets for my mother which I did a post on this blog. I made a blouse from the same fabric and finished the neckline with a circular ruffle. “Couture the Art of Fine Sewing” by Roberta Carr. I used 3 circular ruffles for the neckline and because I did not want to finish the outer-edge with a serger. I doubled the patterns ( cut 6 circular patterns) and lined the collar with the same fabric for a neat finish. Anybody who have used a circular ruffle on a garment knows that if you want to use a facing the ruffle tend to turn upwards toward the neck and that was not my goal, so I needed to cheat a little or used common sense, because I was planning to use a facing instead of a bias binding. 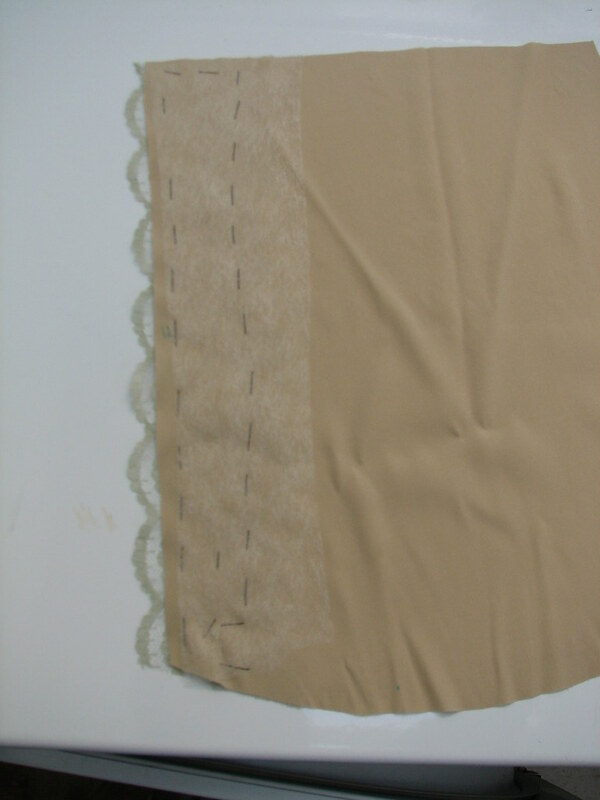 A ruffle which is bind with a bias binding will fall towards the garment. The ruffle is sewn at the neckline and I did sew a hairline away from the stitching line around the neckline. I pinned the facing on top of the ruffle matching seam allowances and turned the garment inside out so I had a stitching guide from the first stitching of the ruffle I sewed the facing a hairline inside the previous stitching. Grade, clipped and pressed the seam allowances from the blouse, ruffle and facing.